This is an article I wrote for the UKSMG News Letter. It provides details and producing an effective 5el Antenna for 6 Metres and measurements form producing a 4le 70 Mhz antenna out of the left over components. Firstly, I would like to thank Pop, YU7EF for creating my extended interest in Yagi antenna design, designing some of my first antennas and helping me along the way with many hints, general help and tips. The next point I would like to raise is this. This antenna is not meant to be a 'gain beater'. We can all surf the Internet and find antennas with incredible gain and performance boasts. 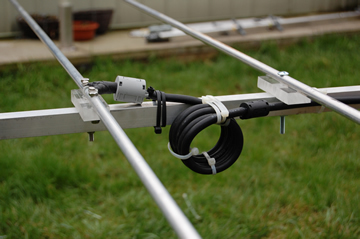 Some maybe correct others may not but the point here is; this antennas has been designed to provide excellent all-round performance from a very compact Yagi and at the same time is simple to build. Earlier this year I installed a nice 3 section tilt over, wind up tower which sits conveniently between my house and the next. The good side to this tower is that it is well hidden and when not wound up, is not an eye soar and well out of general view. The down side is that in order to get antennas passing my house (on the way up) the boom length needs to be relativity short unless I use a longer top section tube which then defeats the object and benefits of my first point. The above meant I had to produce an antenna with a boom of around 3.5 Metres long and my own target from a gain perspective was 10dBi. As apart of general beam requirements, at least 20dB front to back would be appropriate too. For me, the antenna must be broadband and therefore not effected by bad weather, other close by antennas and not needing any matching arrangement at the feed point. The thing is, I had not seen anything out there producing the figures of that compact size. 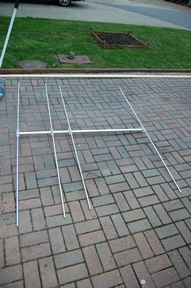 YU7EF's most compact Yagi, a 5 element, is 4.15 Metres in length and produces 10.1dBi forward gain. The next steps are to get the antenna software packages to work and see what can be achieved in theory. Perhaps what I am asking is a little too much? When I embarked upon my antenna design, I downloaded and installed (free of charge) 4nec2 which is a great antenna modelling package http://home.ict.nl/~arivoors/ . It has some sample files which you can alter a play too in order that you may familiarise yourself with the software. Next I purchased EZNEC+ 5 www.eznec.com to do my verification with and lastly, Antenna Model www.antennamodel.com . AM is the package I do my early designs with. 4Nec2 and EZNEC use the NEC calculation engine and Antenna Model uses the MININEC engine. It is good practice to test designs with packages using different engines to ensure there have been no miss-calculations. furthermore, AM has a very good optimising package which will get a very basic design very close to an ideal model very quickly. I will not go into detail and list the features and benefits of both but when we are modelling antennas and predicting performance, it is good practice to confirm the designs within other similar packages in case one has made errors within it's calculation engine. 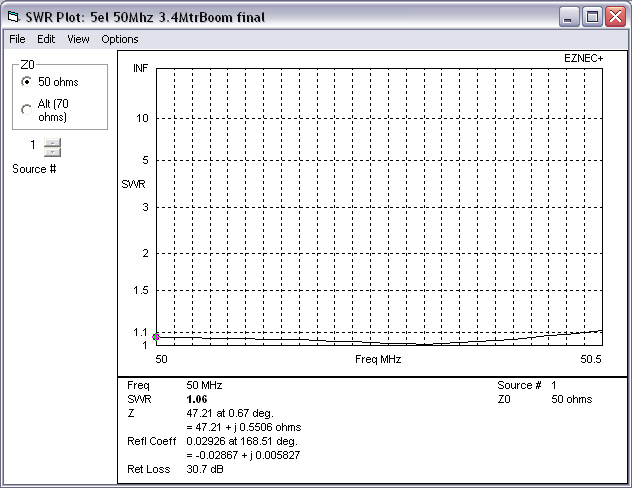 Antenna Model has a very powerful optimiser too. Intended to fine tune and finish off designs for you, the Antenna Model optimiser can make a reasonable antenna out of a few wires of approximate length for the band you are building it for evenly spaced apart. Obviously there are a number of settings and adjustments within the package that you have to make and when looking to build an antenna which requires no matching arrangement (which we are doing here) things get a little more complicated as the software does not technically support such designs. However, a 'rough diamond' result is achieved within this optimiser much faster than if one were to manually trim lengths then test the antenna. 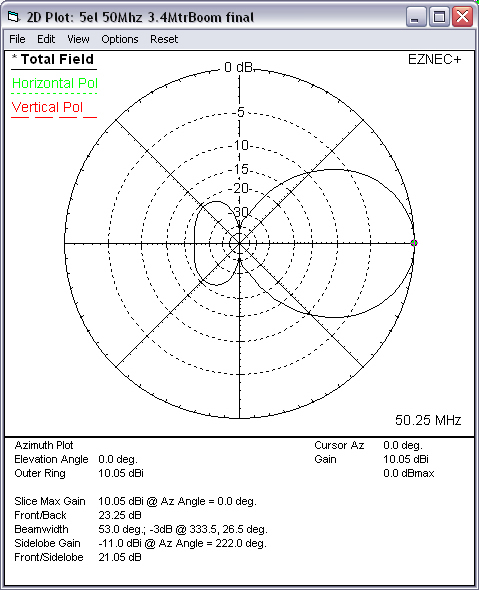 Once a model has been achieved within Antenna Model and tested within EZNEC+. If we look at the length versus gain, we can see that we have come to within .04 dBi forward gain of Pop's 5 element beam (albeit we have less front to back ratio) with a full .75 Metre shorter boom length. The SWR has been retained and our target Front of Back ratio of better than 20 dBi has also been achieved. One of the design criteria I had not mentioned above was that of all parts being available in sizes obtainable in the UK and at the best prices. I did a little research before starting the design work and luckily for me, found a local merchant ( http://www.clifdasteels.co.uk/ ) that was able to supply the aluminium tubing I needed but in selected sizes and lengths. 3/8 of an inch was going to cost just £7.00 per 5 metre length whilst ½ inch was just £5.00 per 5 metre bar. This meant I would not use any tapper whatsoever. The ½ is good quality, thick wall so does not show any sag or bend. Next was the boom thickness. This was a project for the Christmas period and I was not sure how well the antenna would stack up so I purchased an 1,1/4 inch square bar along with an inch square. Again, these lengths (£15.00 and £12.00 per bar respectively) are good quality thick wall and therefore, the 1inch square bar was more than ample to hold up this compact Yagi without any additional support or sag. The Insulators are being made from clear 15mm thick Perspex which like most things these days was purchased from Ebay. A Table saw and table router would come in handy and make the insulator job a little more palatable. If there were enough people that wanted to build this project and wanted to use my insulators too, perhaps I could build a few extras? The first thing for me to do was to make the insulators. If these did not come out right, then another method was going to be needed. Also, this is the most difficult part of the project. I have a table saw and table router which does make things a little easier. However, the same job can be carried out with hand-held devices too. If you really do get stuck, let me know. The insulators are cut from the 15mm thick Plexiglass/Perspex and are 100mm long by 30mm wide. First, I cut a 100mm strip of plexiglas and routed a 1 inch grove in the centre from one end to the other which should be between 1 and 2mm deep. When you have done this, you can test your work by placing the plexiglass onto the square boom length and if you have completed the task correctly, the piece should not move side to side. 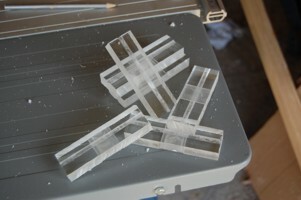 Now cut the 100mm length into 30mm strips, you will have more than you need, 9 in fact so you have a few spares. As we did with the 100mm strip, we now need to route a grove in these 30mm wide strips from the elements to sit upon. These need not be ½ inch. I made this around 4 to 5 mm wide In order that the elements sit above the insulator just touching it on each side of the grove. However, this is enough to keep it is place. Check out the photos of the insulators to ensure yours look like these! We will have to do a little more work with the dipole insulator so we will leave this one until last. Starting with the reflector end, place the insulator over the boom in its mounting position and align one edge with the end of the boom. Having measured the width again (100mm) and marking the centre, drill (M6) a hole through the centre of the insulator (in the recess for the element) and through the boom too. Now measure the reflector element and establish the centre point. Drill an M6 hole here too. Using one of the M6 65mm length stainless steel nut/bolt/washer sets, secure the reflector to the boom. Hopefully, everything fits fine, now remove the element and bolt the insulator to the boom on its on. Now, turn the boom on its side so as the insulator is pointing straight up and down. Hook a tape measure end on the back of the insulator where its end meets the boom end and measure along the boom to the point where the driven element would be in this case, .503 metres. Mark the boom with a pencil of knife. This is the point where the back of the driven element insulator will align with. Now conduct the process we did with the reflector by drilling through both insulator and boom and placing a stainless steel bolt through it. Once all elements are completed, we need to go back to the driven element insulator and remove its insulator. The dipole section will have our nylon 8mm rod inserted into each piece of the dipole and just 10mm of nylon showing between the 2 aluminium lengths. This is the only element where the stainless steel bolt will NOT go through the element itself. Instead we need to countersink the drilled M6 hole with a hole big enough to fit the head of our bolt into. This should be 5mm deep into the insulator in order that the bolt sits well below the dipole centre. Next we need to align the dipole upon the insulator and measure along each side 5mm from the nylon joint and drill through both the element and the insulator. This time, we need to countersink the holes as we did above but this time, the countersink will be from the bottom. Insert the stainless bolts (50mm M6) from the bottom up into the elements, place a washer upon these with a nut and tighten them. The protruding portions of the bolt will be used to bolt our coax to with the left over nuts and washers we have. All elements can now be bolted to the boom. Whilst there are more complex baluns that can be installed, the simplest is a coaxial balun at the feed point. This is where a few turns of the feed coax help reduce any standing waves on the outer shield of the coax. I have created one (see photos) with a diameter of between 3 to 4 inches across and 4 to 5 turns. I have added some clip on ferrite chokes too. The builder may choose to install a lambda type balun consisting of a ¼ wave length and a ¾ wave length piece of 50Ohm coax connected at the feed point. 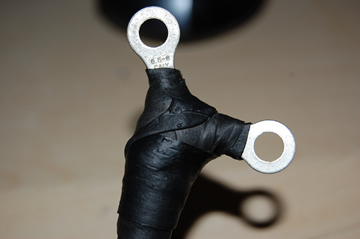 Details of construction of this type of balun can be found on the Internet. 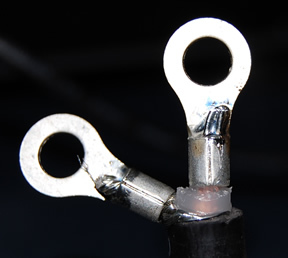 In order to seal and connect the coax, I have soldered two large ring connectors to the coax. It is important to note that as soon as the inner and outer cores are separated, they become a radiating part of the antenna and add to the dipoles length. Therefore, these should be keep as short as possible. We also need to consider the weather gaining access to the coax and therefore, need to ensure (with lots of rubber adhesive tape) that this is secure and well sealed. At this point, you should be ready to go! My antenna is now on the tower and shows a flat SWR of 1.0 from 49.9 through 50.275 at around 50.5 Mhz if starts to rise quickly and by 50.7 it is out of acceptable ranges. If this is a first time project or you are not confident with your measurement or cutting abilities, cut each element length a few mm too long. If the antenna does not sit where you want it to be, you can file the elements down. If it is too short when you measure afterwards, you can not add length to it! Whilst these elements are electrically connected to the boom, they perform as isolated elements due to the fact the connection is at 'centre zero' position of the element but will still require correction. This amount is around half as muhc as would be needed if there were no insulator at all. 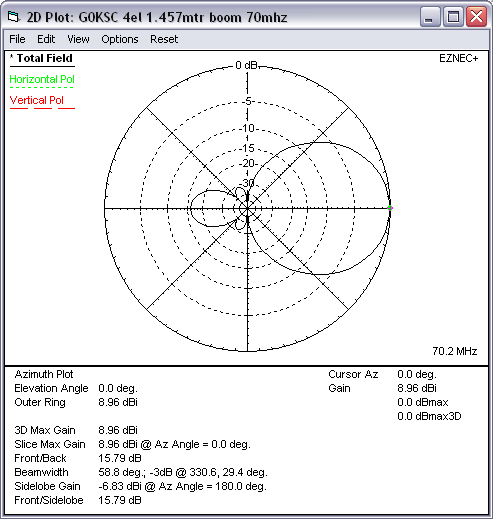 Email me for correction figures on your antenna as it varies with boom diameter. Take your time and don't rush. If you do not have everything you need, wait until you do have before starting the job. I have sacrificed a little front to back ratio (as 4 is such a quite band) in order to give a little more gain. The antenna achieves 8.96dBi forward gain at 70.200 Mhz and a F/B of just under 16dB. All with just a 1.457 Metre boom too. In addition, this antenna provides a very good pattern when stacking.